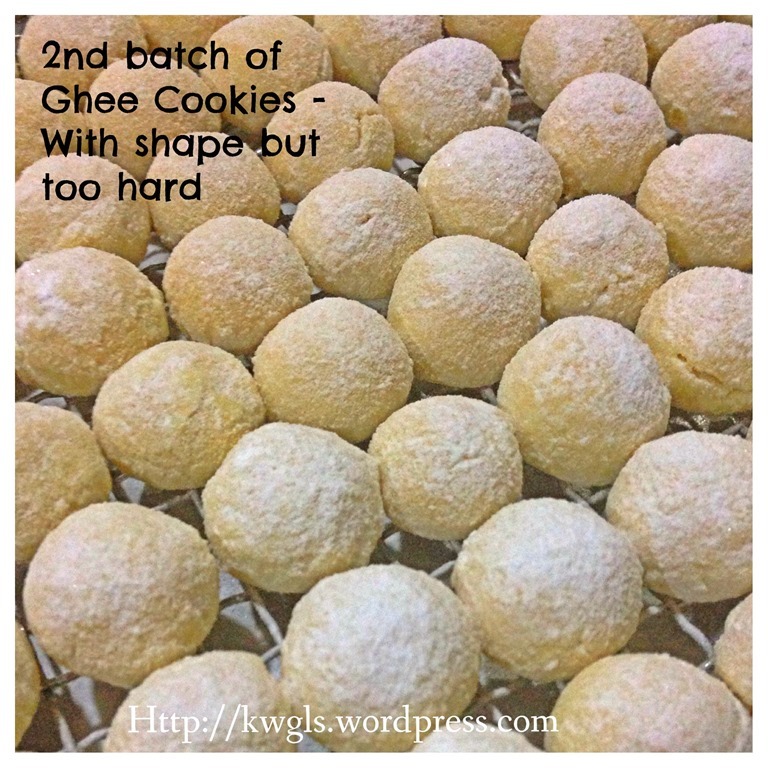 This is the third attempt of preparing this cookie since I started blogging last year. I am still reluctant to issue the post because it looked rather unsightly. I told myself, if I issued this post, it will be one of my ugliest cookies that I have ever prepared. However, I have finally decided to issue this post because it is a very successful cookie, with the texture that I am looking for, really melt in the mouth full of buttery flavour. 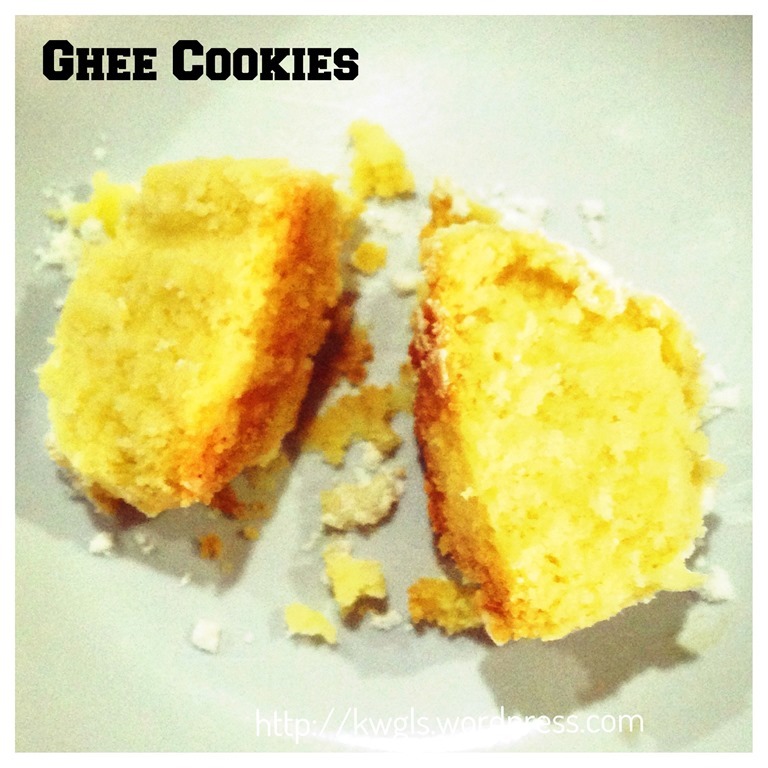 In my first attempt of making this childhood cookie, the cookie is almost shapeless possibly due to too much ghee and too little flour were used. 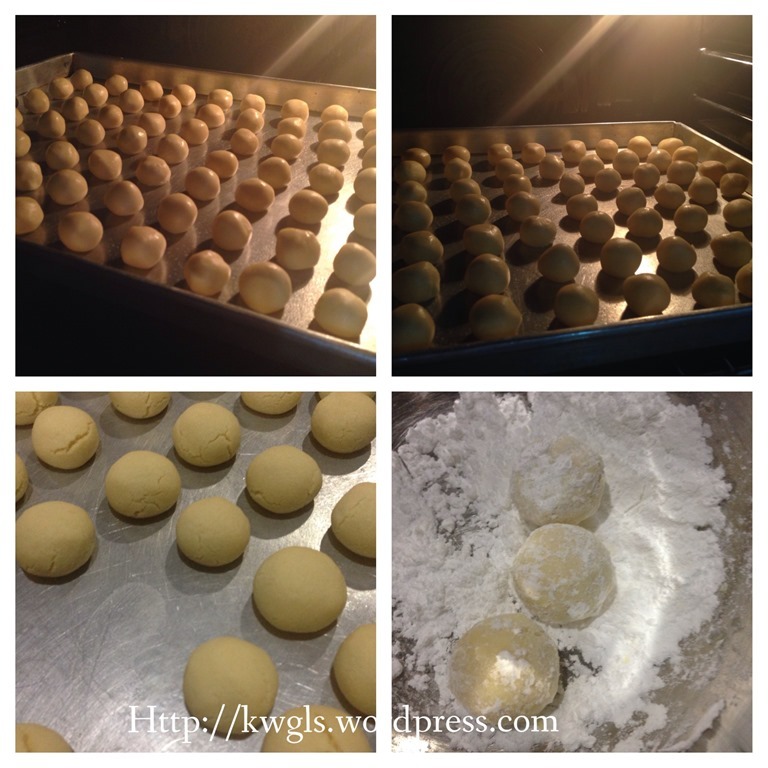 When baked, it is not a ball but it flattened and became a biscuit shape. In my second attempt, I get a very nice shape but the cookies were very hard. That is possibly because of the inclusion of sugar powder in the batter. I shelved the issuance of that adventure until I met my wife’s cousin during the Winter Solstice festival. My wife’s cousin assured me that the cookies were very easy to prepare and I tend to believe what she said because it is a traditional cookie. All traditional cookies are very easy to prepare due to limitations in ingredients, baking equipment or even measuring equipment. 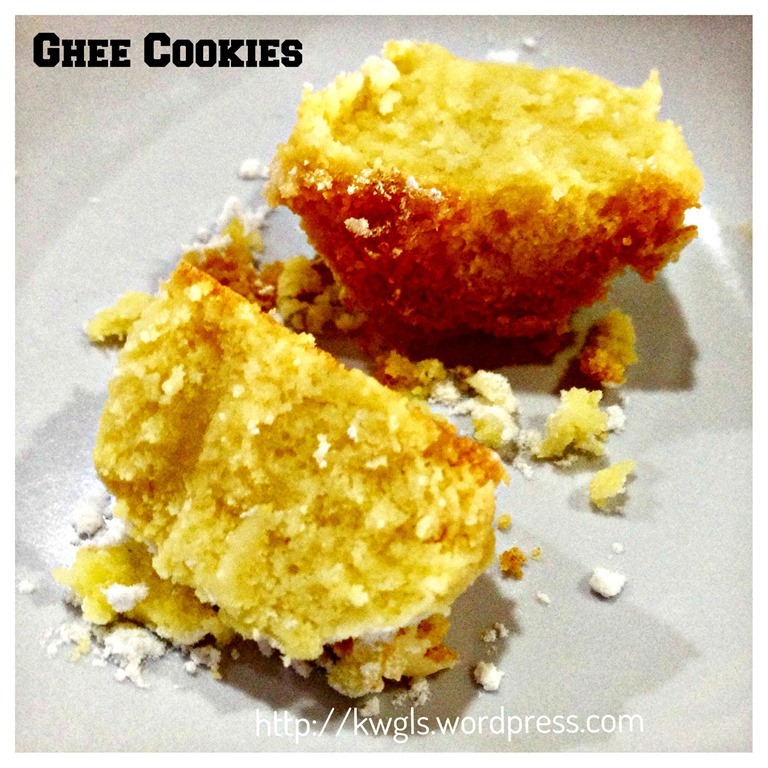 She told me that it is made using 2 ingredients, ghee and flour, mix and then bake. No sugar shall be added as it will make the cookie hard. Since I am still searching for a recipe for this childhood cookie, I have decided to try her verbal recipe and in fact, I always trusted verbal recipes from the elders. There are many recipes in the net, some called for use of egg yolks, some use egg whites, some put sugar in batter, some use semolina flour and some use plain flour.. and this recipe is one of the most basic traditional recipes using only 5 ingredients : ghee, milk powder, plain flour,salt and icing sugar..
Line a baking tray with parchment paper and pre-heat the oven to 160 degree Celsius. Stir fry the flour in a pan for about 5 minutes under medium heat. Cool and set aside. The main purpose of this step is to pre-cook the flour and make the flour lighter. However this step is optional. 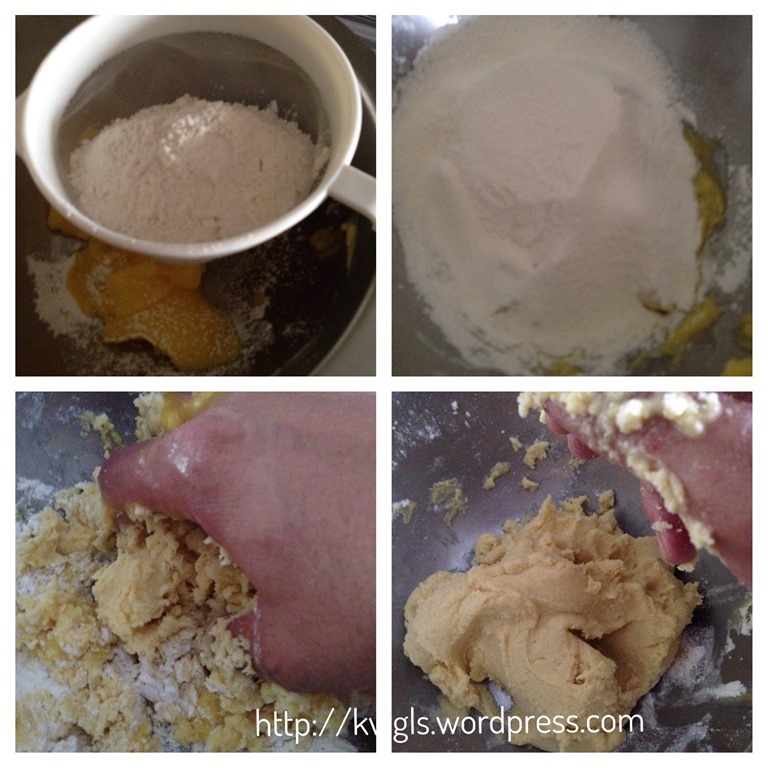 In a mixing bowl with ghee, sift in plain flour, milk powder and salt. Use your hand to lightly knead until the dough is well combined. Let in rest/chill for half an hour before shaping in the refrigerator. If you can handle the soft dough, this step is optional. 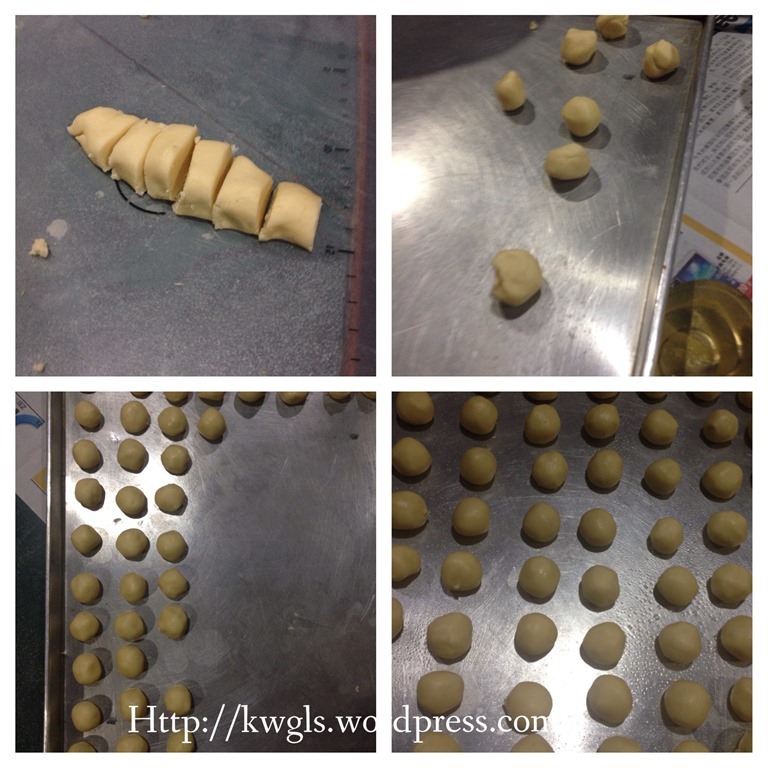 After half an hour, shape the dough into a long cylindrical shape and cut into about 10 gram per dough ball. Shape into a round ball. If it is too soft, chill it again. Place the ball in the baking tray. Bake in the preheated oven at 160 degree Celsius for 8-10 minutes. When it is out of the oven, roll the cookie in a bowl of sugar powder. You have to be careful as the balls are very hot and fragile. Transfer the sugar dusted balls to a wire rack for complete cooling. When cooled, transfer to a container. Can keep in an airtight container at room temperature for at least 2-3 weeks. 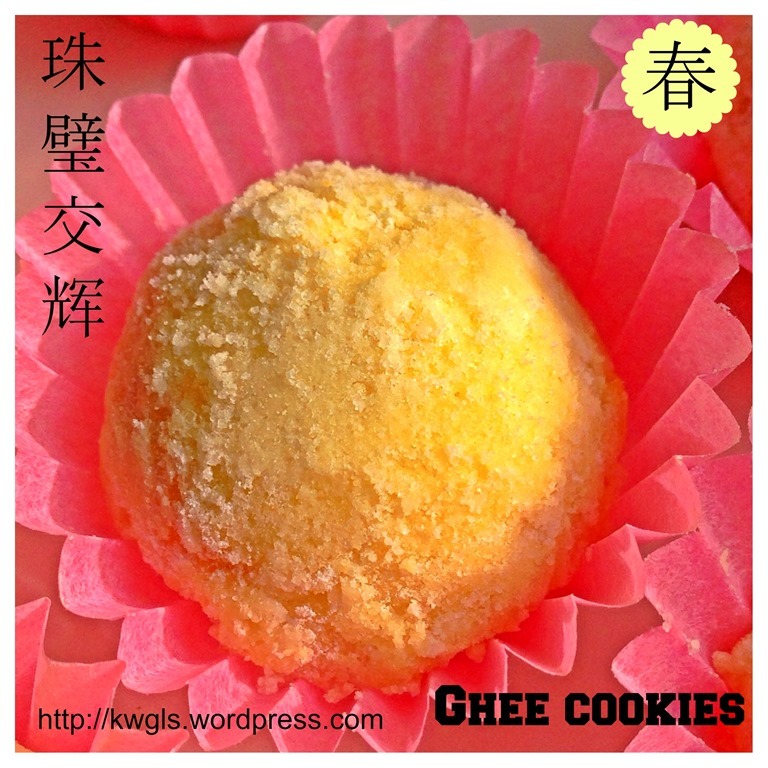 I am blogging cookies that I have eaten during Chinese New Year when I was young. This is one of them. 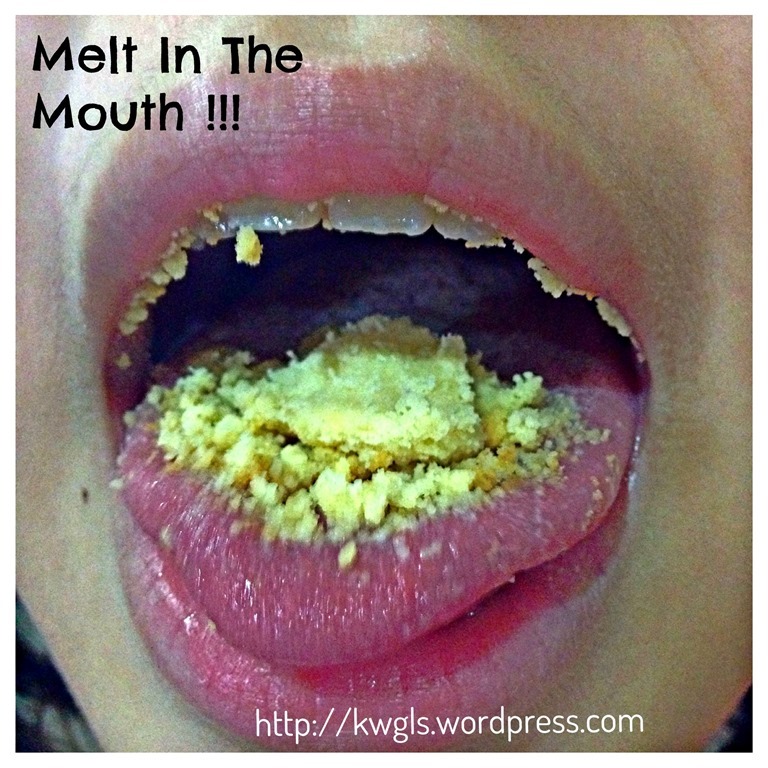 I like it so much because of its creamy, buttery and milky melt in the mouth texture. If you want a nice shape, you can consider adding 1 teaspoon of egg white to the batter. The cookie will be beautiful but become crispy! If you want to melt in the mouth, follow this traditional recipe and this is definitely a recipe keeper.. I have to thank my wife’s cousin, Ms. Beatrice K. this recipe and some of my friends who have generously shared with me their recipes including May L, Nor Norzela and Zahrah J. I didn’t have a chance to try all recipes as yet but I believed it will be as good as this simple recipe. 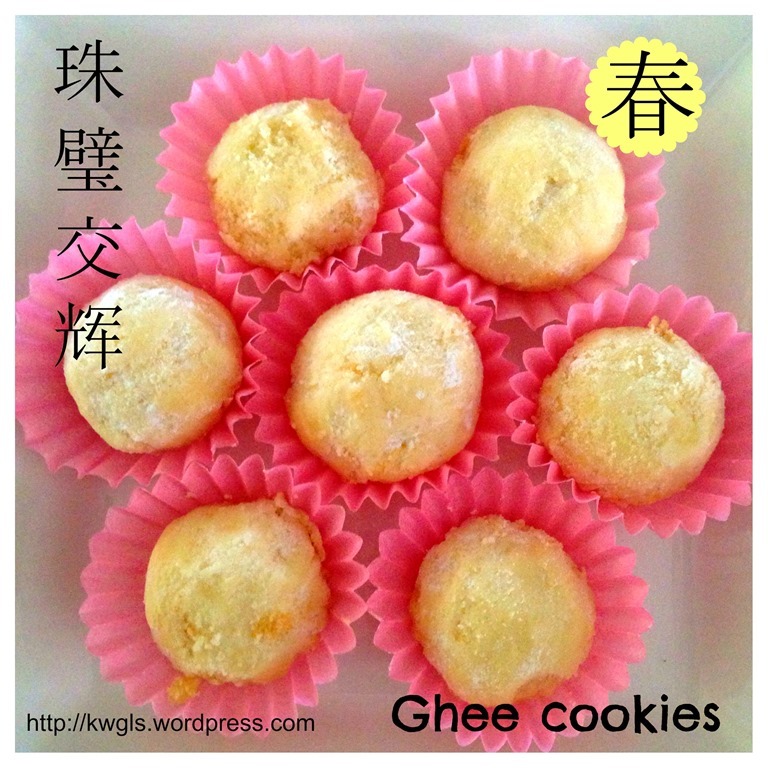 This entry was posted in Cakes and cookies, Chinese New Year 2014, Food Preparation Series and tagged Chinese New Year 2014, 莫莫饼， 毛毛饼, ghee cookies, GUAI SHU SHU, Guaishushu, kenneth goh, kueh makmur, kueh momo, postaday, sugee cookies. Bookmark the permalink. I am unsure. 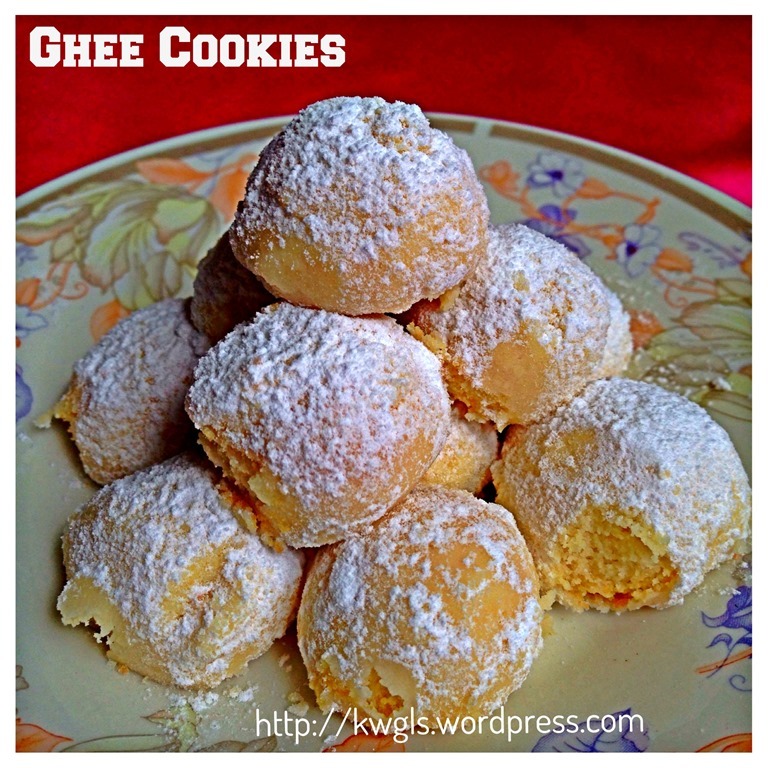 Look liked too much ghee and too little flour. Is it possible that you have measured wrongly. May be you can try again. 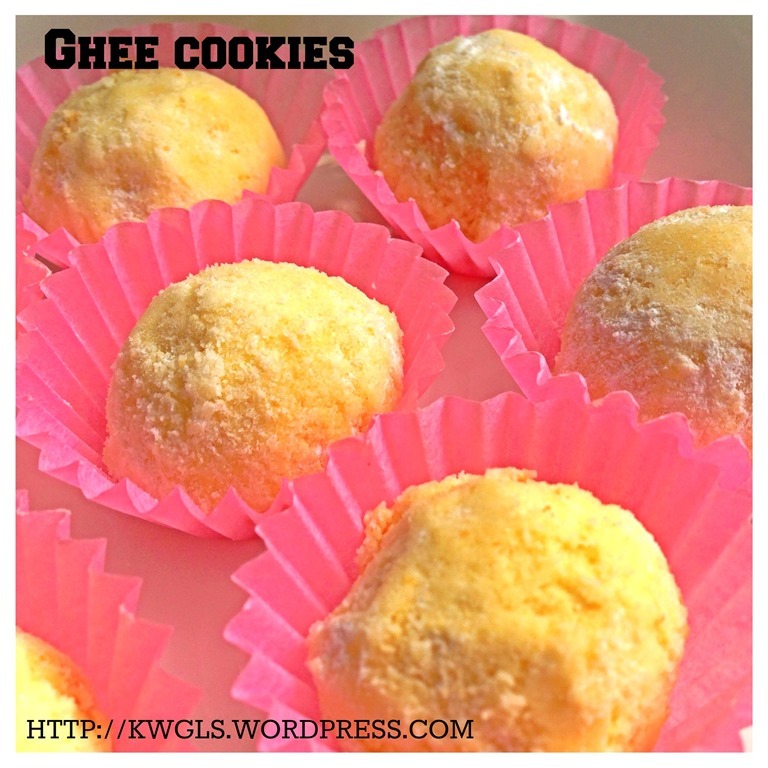 wa, you really showed how it looks like melt in the mouth..haha..earlier i was asking about ghee cookies in your almond ghee cookie post..this is the one i’m referring to with your almond ghee cookie..so this doesnt hv semolina flour..do both taste quite similar? actually the shape of the cookies are not that ugly as what you said. 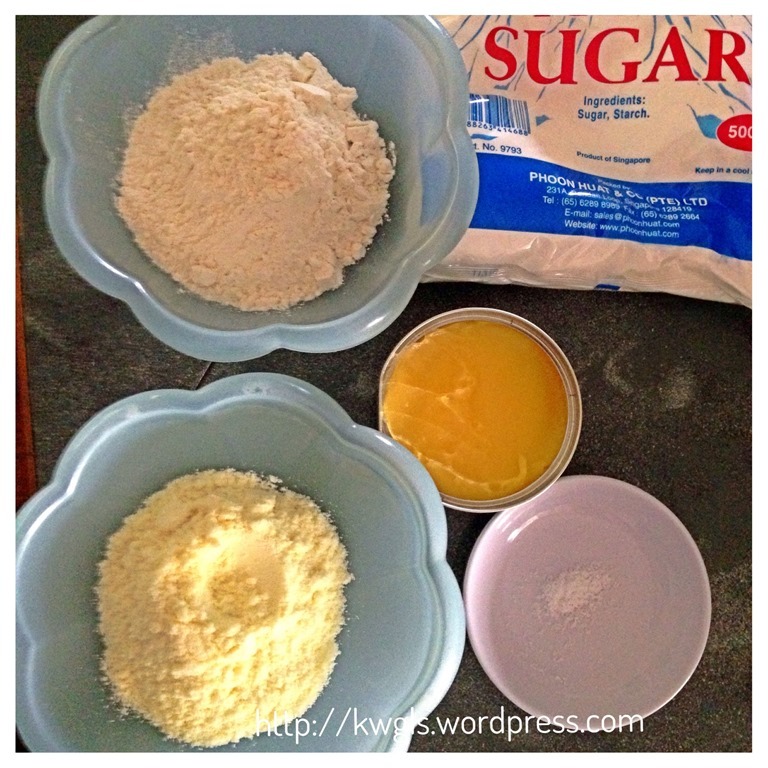 I don’t have milk powder… what might I substitute it with? or can I omit it? 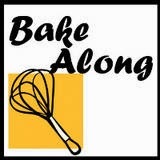 Use all flour. not as fragrant. 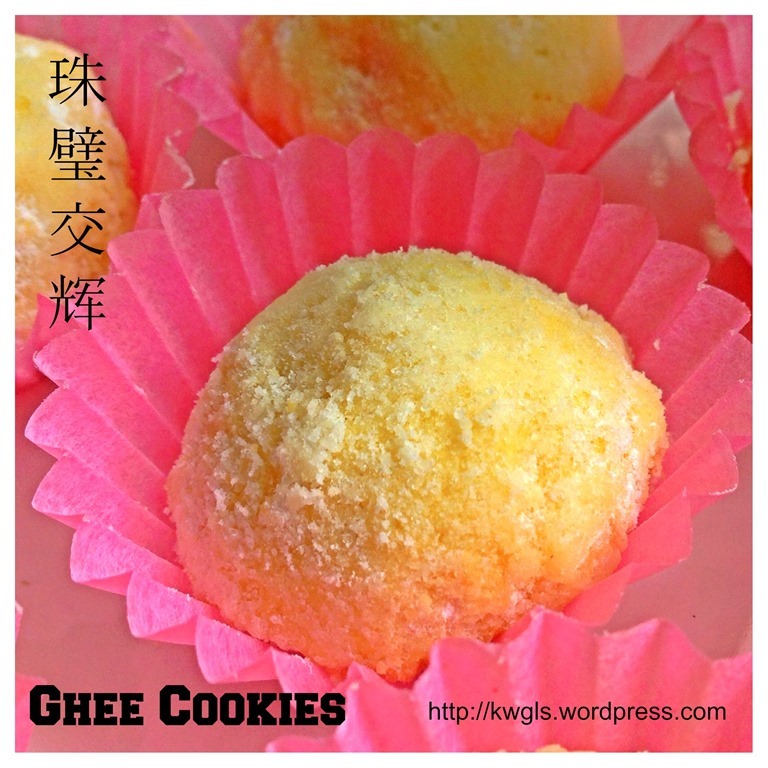 Mix ghee, egg yolks, icing sugar and cornflour well. Add in wheat flour until texture is like wet mud. I used about 400-500g flour. 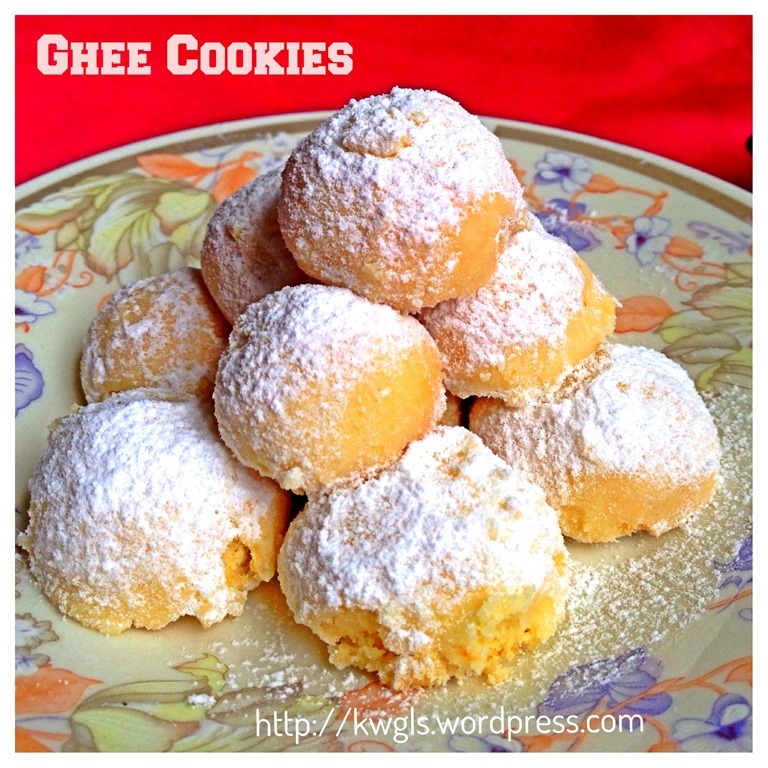 Roll into balls and bake in oven for 15-20 mins using 150 deg c.
Can I substitute ghee with melted butter?